It’s funny how people would chuckle when I tell them I rang bells and lighted incense sticks in my house when we first moved in, and once a year after that. They find it quite strange, “you’re really a witch”, they say. But just the same, they are quick to anyway, put a bowl of rice in their new home, and have it blessed by a priest. They even throw coins to bring luck. When I asked why, they said that’s what the oldies told them. And so I explained, it’s the same concept. You do it with rice and a blessing, I do mine with flowers, candles, salt and a bell. I say tomato, you say tomato. I guess the old folks knew a thing or two about the energy (“spirits” they say) around everything, especially our homes. I see it in just the same way as having to sweep out the dust and remove the clutter. We do have to clean the stagnant energy as well. I remember growing up and having had to move homes at least 15 times. There was always something different about every home. Some felt happier, others felt just sinister, more dark (well, others would blame ghosts or the Kapre in the Balete tree.) 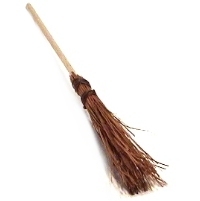 But I have learned to cleanse my home in my own way, reading articles by fellow good witches. I don’t understand what happens, but it always feels as though the house is a little brighter. As though I just switched the lights on again. Here’s my ritual for clearing spaces. I do it right before the Chinese New Year or when I feel like arguments or problems have dampened my space. I like using the 4 elements so fire (candles), air (incense), water (I just use a spritzer with essential oil) and earth (salt). Don’t worry, there’s no chanting or dancing around the fire. It’s really simple and you can even just do it like an ordinary cleaning day. 1. Clean the house physically. Remove clutter. 2. Open windows and let the light in. 3. Put lots of flowers around the house. 5. You can put salt in little containers in four corners of the house and leave it for 24 hours. But don’t be too obsessed about this. 6. Use a bell or even just clap to “dislodge stagnant energy.” Start at door, then do it in every corner of each room. My kids and I do it as a sort of fun game. So you don’t feel too weird, just liken it to the Chinese custom of lighting fireworks to ward off demons during the New Year. 8. While doing all these, you might want to intend what you want to happen or create. Sometimes it’s just to clear out energies and harmonize it. Or it may be to clear out the energies of previous occupants (if you’re moving into a new place.) I usually also try to bless the house and all that live in it.